If there’s any niche in fly-fishing that inspires even more obsession and effort than bamboo fly rod building, it would have to be the Microskiff movement. I first heard the term “microskiff” applied to small light craft, often modified to resemble flats boats, in about 2005. Today there are at least two communities dedicated to the movement online. Microskiffs don’t have a hard and fast definition, but generally they are around the same length as a normal flats boat (16 to 18 feet), but not as wide. They take motors up to 25 horsepower, and they can float in less than six inches of water. 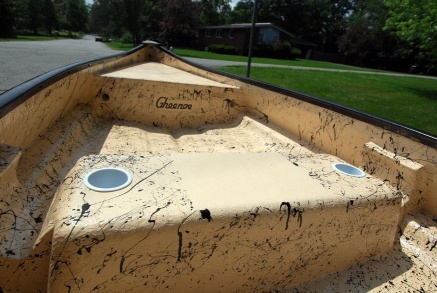 The most popular microskiff is without question the customized Gheenoe. A Gheenoe is a kind of fiberglass flat-transomed canoe, invented by an aerospace engineer named Harley Gheen (pronounced “Geen”, not “Gene”). Gheenoes have a special bottom that makes them very stable – stable enough to stand on, and, indeed, walk around in. This winter, Georgia angler Andrew Wright purchased a late-1980s model 15’4″ Gheenoe Hisider, which we customized together. After cleaning the boat thoroughly, we began by cutting through old fiberglass, then removed cracked sections and cut patterns to fit the odd hull. We then added decks and rod storage, modified the central seat to shore up the boat, and hung an eight horsepower motor on the skiff. We glassed and painted, and this spring we started targeting carp in the Chattahoochee River in Atlanta. 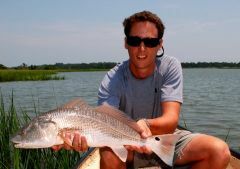 Andrew recently towed the boat to the marsh and successfully chased redfish. His 8-horse two-stroke will push two anglers 18 mph (which is about as fast as seems safe, especially in choppy water). The thing is, despite all our efforts, his boat pales in comparison to some of the amazing custom jobs posted around the internet. Poling platforms, center consoles, trim tabs, jack plates–all the things you would expect to see on a Hewes or a Hells Bay can be affixed to a Gheenoe. While the end result of that level of modification isn’t cheap, the bonus comes when you need to pole onto a true 4″ flat with three men in the boat. Microskiffs are too specialized to achieve widespread use nationwide, but along the Gulf Coast they have started to gain a lot of traction. 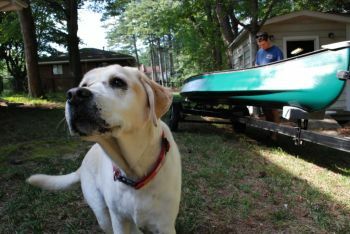 Companies like East Cape Canoes and Terrapin are now making de facto factory microskiffs, and members of the Gheen family have a separate customization business called Custom Gheenoe. You can learn more about microskiffs on Microskiff.com or CustomGheenoe.com. The forums on those sites are full of interested (some might even say rabid) boat builders, many with impressive modifications to their credit. Have questions or concerns about strapping an engine to a glorified waterski? Post them in the Comments section!